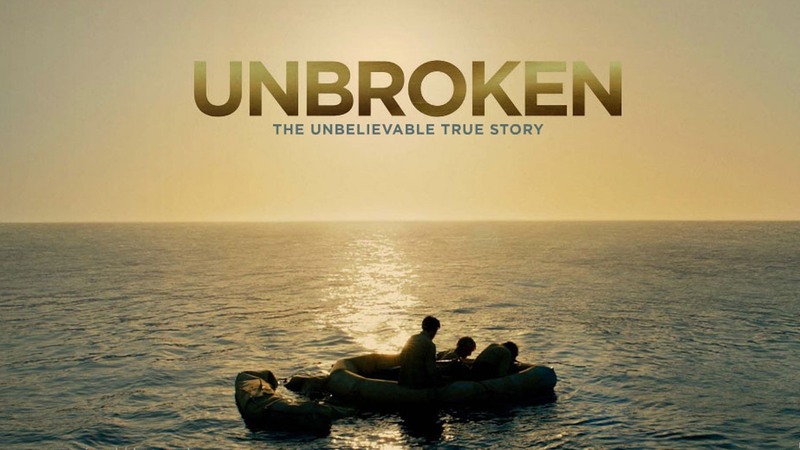 Unbroken is a 2014 American biographical war drama film, produced and directed by Angelina Jolie, and based on the 2010 non-fiction book by Laura Hillenbrand, Unbroken: A World War II Story of Survival, Resilience, and Redemption. The film revolves around the life of USA Olympian and athlete Louis "Louie" Zamperini, portrayed by Jack O'Connell. Zamperini survived in a raft for 47 days after his bomber was downed in World War II, then was sent to a series of prisoner of war camps. The film had its world premiere in Sydney on November 17, 2014, and received a wide release in the United States on December 25, 2014. The film received mixed reviews from critics. The film opens showing Louis "Louie" Zamperini flying as a bombardier of a United States Army Air Forces B-24 Liberator bomber, during an April 1943 bombing mission against the Japanese-held island of Nauru. The plane is badly damaged in combat, with a number of the crew injured. The brakes of the plane are shot away, but the pilot, Phil, manages to bring it to a stop at the end of the runway thanks to a flat tire. The film flashes back to Louie's childhood as a young Italian-American boy in Torrance, California. Louie is a troublemaker, stealing, drinking liquor, and smoking, to the disappointment of his parents. He is picked on by other kids for being Italian. One day, Louie is caught looking up women's dresses from under bleachers during a track meet, and runs. His brother Peter sees how fast he runs, and decides to train him to be a runner. Peter trains Louie every day to become his best. As he grows, Louie becomes an accomplished distance runner, earning him the nickname "The Torrance Tornado," and eventually qualifies for the 1936 Summer Olympics in Berlin, Germany. Louie does surprisingly well in the Olympics, coming in 8th and setting a record for speed in the final lap in the 5000 metres race, running it in 56 seconds. Returning to 1943, Louie and the surviving crew of the previous mission, along with replacement crewmen, are sent on a search and rescue mission with a plane that had previously been used for spare parts. Louie does not believe that the plane is airworthy, but the others tell him that it is suitable. During the mission, however, both of the plane's left engines fail, causing them to crash in the ocean. Louie and two others, Mac and Phil (the pilot of this, and the previous mission) survive and live on two inflatable rafts. After three days, a search plane flies over them but does not see them and they are unable to get its attention. On the 27th day, they get the attention of a Japanese plane, which strafes the floating rafts but misses them. On the 33rd day Mac dies, leaving only Louie and Phil. On the 47th day, Japanese forces capture Louie and Phil and they become prisoners of war. The Japanese force Louie and Phil to tell them what they know about the Allies. Louie tells them that he doesn't know anything because he's been stuck on the raft for more than a month. Their captors do not believe them and send Louie and Phil to a P.O.W. camp. Louie and Phil are separated into different camps. The camp in Tokyo, where Louie is sent, is headed by a Japanese sergeant, Mutsuhiro "Bird" Watanabe, who treats him very cruelly, in part because of Louie's status as a former Olympian. Watanabe is especially tough on Louie (presumably) out of jealousy, beating him often. Louie is given the opportunity to broadcast a message home saying that he is alive. When he refuses to broadcast a second message that would be anti-American, he is sent back to camp where Watanabe has all the other prisoners punch him for not showing respect. After two years, Watanabe gets a promotion and is taken out of the camp where Louie is being held. Louie is grateful that he is gone. One night the camp is damaged when Tokyo is bombed by American forces. Louie and the other internees are forced to move to another camp where Louie discovers, to his horror, that Watanabe is in charge. The prisoners are now put to work loading coal barges. One day after Louis sprains his ankle and is unable to work, Watanabe tells him to lift a giant piece of wood. Louis successfully lifts and holds up the wood, angering Watanabe and leading to a harsh beating. At the end of the war, Louie and the other prisoners in the camp are set free to return to their homes. Back home in America, he kisses the ground and hugs his family. At the end of the film, there is a slideshow showing what happened after the war. Louis was married and had two children. Phil survived and eventually married his sweetheart. Mutsuhiro "Bird" Watanabe went into hiding for several years and successfully evaded prosecution in spite of being listed in the top 40 most-wanted Japanese war criminals by General Douglas MacArthur. Louie lived out his promise to devote his life to God and forgave his war-time captors, meeting with many of them. Watanabe, however, refused to meet with Louie. In January 1998, Louis had an opportunity to revisit his time as an Olympian when he ran a leg of the Olympic Torch relay for the Winter Olympic Games in Nagano, Japan. He was four days short of his 81st birthday. The site for his leg of the relay was not far from one of the POW camps where he was held during the war. The closing titles reveal that Louie died on July 2, 2014 at age 97.